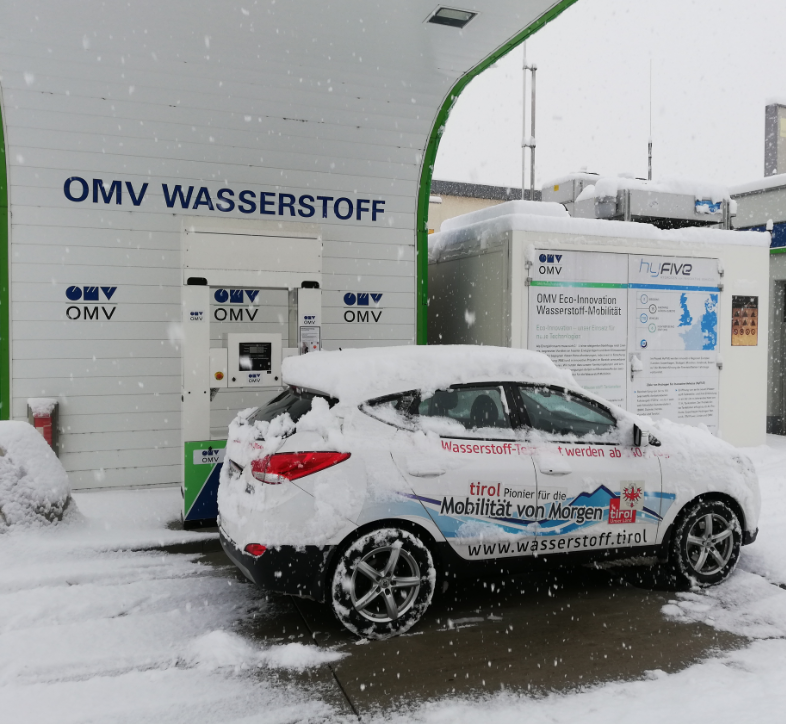 On a quiet day in snow-covered Tyrol at 6:00 am, I set off in the electric hydrogen car (Hyundai ix35/Tucson FCEV) heading North to Munich (Bavaria) and beyond that to Weichs. I was going to be meeting at Weichs with a cartoonist, a journalist, an IT-student and two cartoon characters. 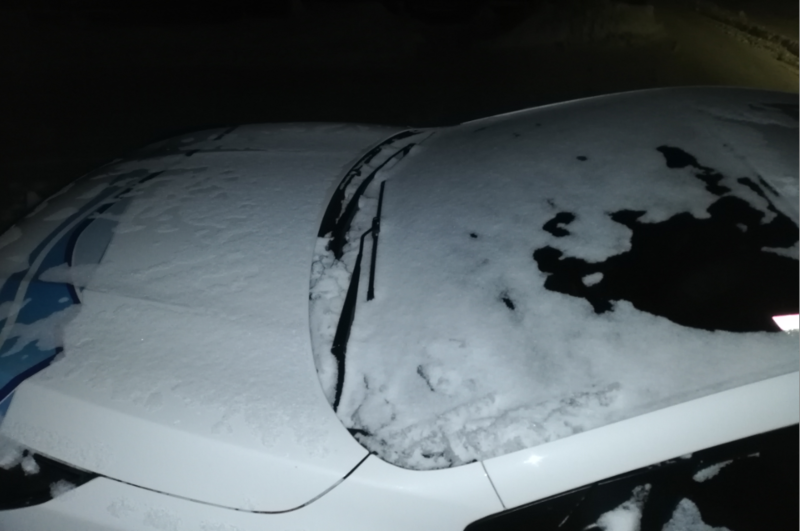 The engine started perfectly at minus 6 degrees Centigrade (21°F), and off I went with the electric hydrogen car. Just to make sure that I had enough hydrogen with me, because you never know, I refuelled 0.98 kilograms of gaseous hydrogen (GH2) in Innsbruck (OMV Andechsstrasse) at 06:24 am; as can be seen below. 15 minutes later, I was cruising at 100 kilometres per hour (62 miles per hour) on the Austrian Inntal-Autobahn A12 heading North to Bavaria. 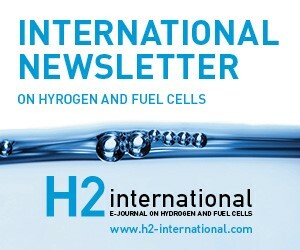 The average hydrogen consumption on the Autobahn was around 1.5 kg per 100 km. Rarely did I see 1.0 kg, actually only when reducing speed by lifting my foot from the acceleration paddle a little bit. And, when I added some momentary revving then the specific consumption jolted up to 3.5 kg before settling back at somewhere between 1.0 and 2.0 kg. The Austrian-German border was crossed at 07:26 am and I continued my journey on the German Autobahn A93, where I drove 130 km/h or even 160 km/h (80 mph resp. 100 mph) at times. 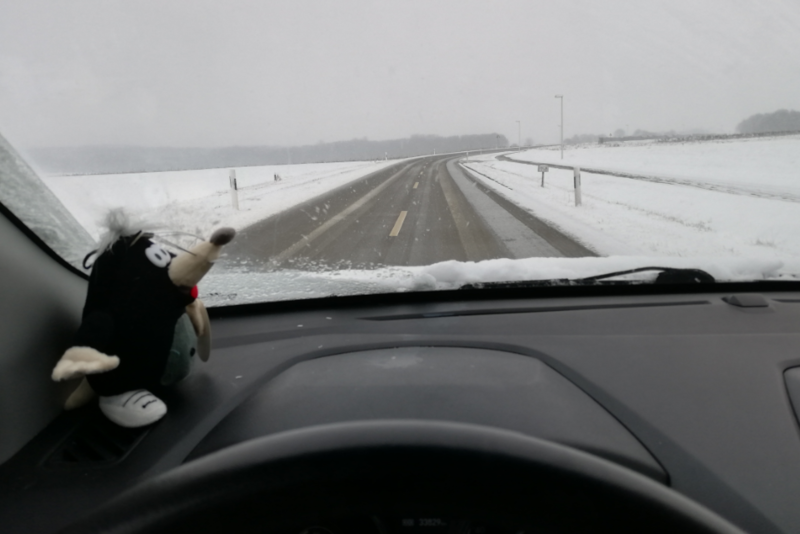 The temperature in Germany was above freezing point, and the traffic was flowing. After leaving Munich behind me, which I had reached at 08:00 am, I travelled through Unterschleißheim (where I once before refuelled at Linde Hydrogen Centre), Badersfeld, Hackermoos, Amperpoching and Esterhofen. At 08:47 am I reached Weichs (County Dachau), half-an-hour North of Munich. Little spots and dots of snow lingered around and a church greeted me when I entered the township of Weichs. 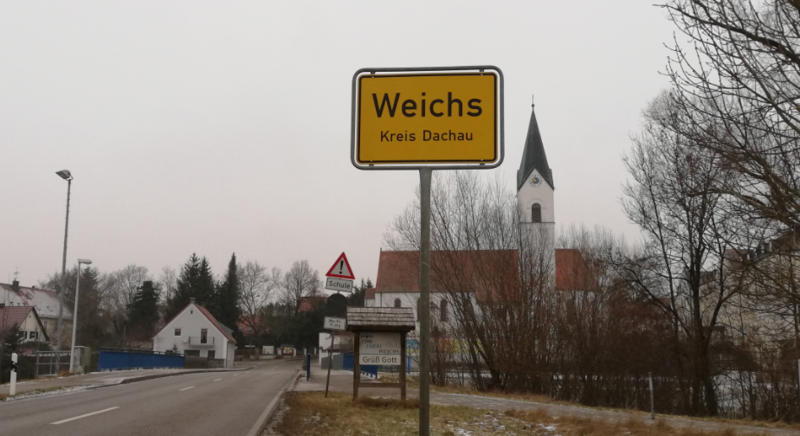 A sign declared the presence of Weichs since 1,200 years; in reflection, the initial fuel cell was only invented 180 years ago. After a short postcard moment, I drove up to the mansion of Mr. Armin Schöntag AGD, professional cartoonist with a fuel cell background, owner of a convertible Renault converted to run on liquefied petroleum gas (LPG) and a Renault ZOE, and who designs and draws cartoons among others with hydrogen topics; see picture below. I joined Armin for breakfast along with a journalist, Mr. Nefzger, and Armin’s Son Arne who is studying information technology. On the table, a cartoon character cuddly toy, called “Frielo” (a mole), sat between the dishes and cups together with us. Our conversation spanned across the world of hydrogen and the world of comics. We found that both go together well. 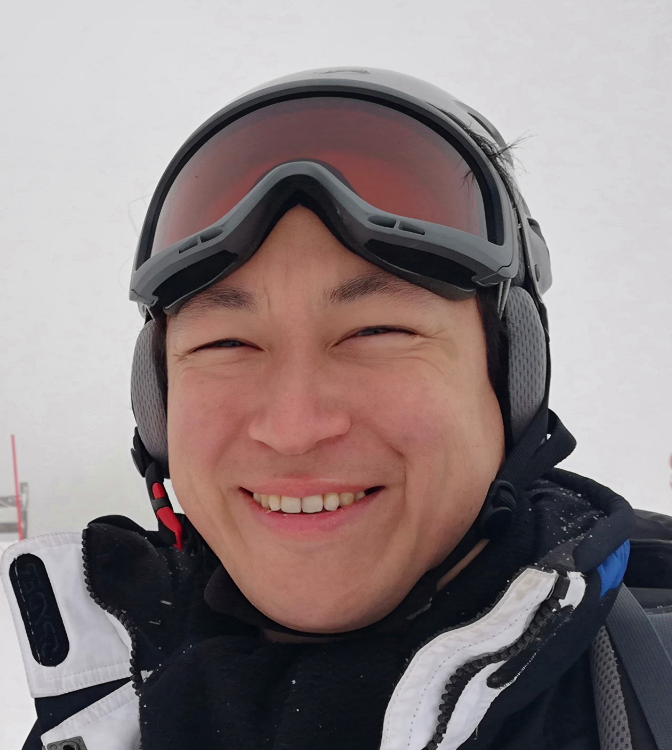 My request to Armin was to give my driver’s nickname #HydroChan a face, a bodily shape and humour. 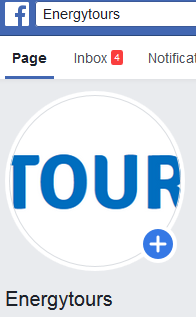 What could a hydrogen traveller (10 European countries, 20,000 km/12,400 mi, 100+ hydrogen refuellings in five years sofar) expressed as a cartoon character or a cuddly toy look like, and what animal would it be? Armin, through his platform IMAGEFIGUREN, has created many characters. 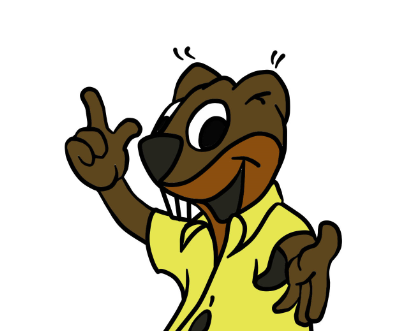 For example, “Hitzlifitzli”, a fox, is a fan of fuel cells, while “Weichser Frechdachs”, a badger, is the symbol of Weichs. As a companion for the road and my way back South to Tyrol and to return the electric hydrogen car, I was introduced to Frielo, a mole. After leaving the persons and characters, snow had meanwhile covered a good deal of Bavaria as well. So, Frielo came with me and I sat him on the dashboard, as above (please excuse the missing safety belt). 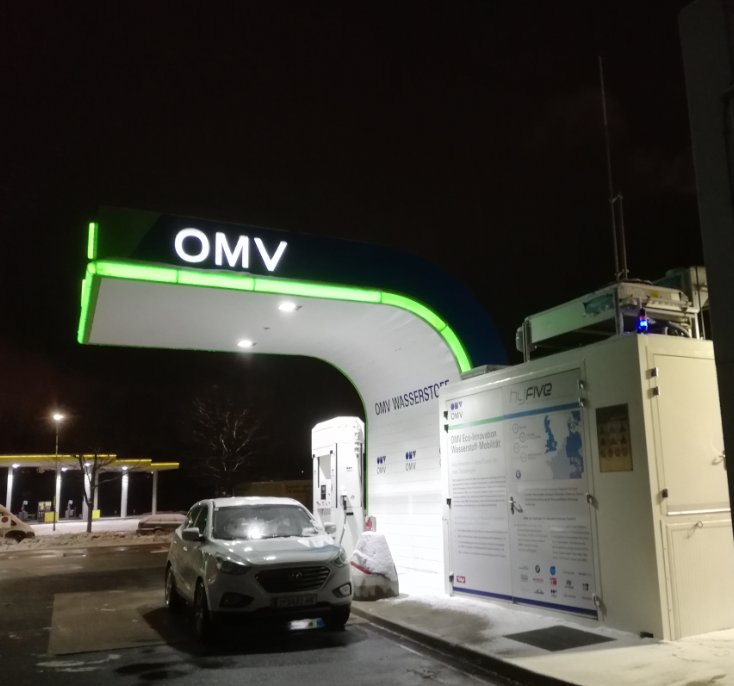 And, we conversationed along the way: “Where are we driving next, Frielo?”, “Well, we are going to Munich to refuel hydrogen, Hydrochan!” So we went; see separate hydrogen refuelling in Munich-blog. 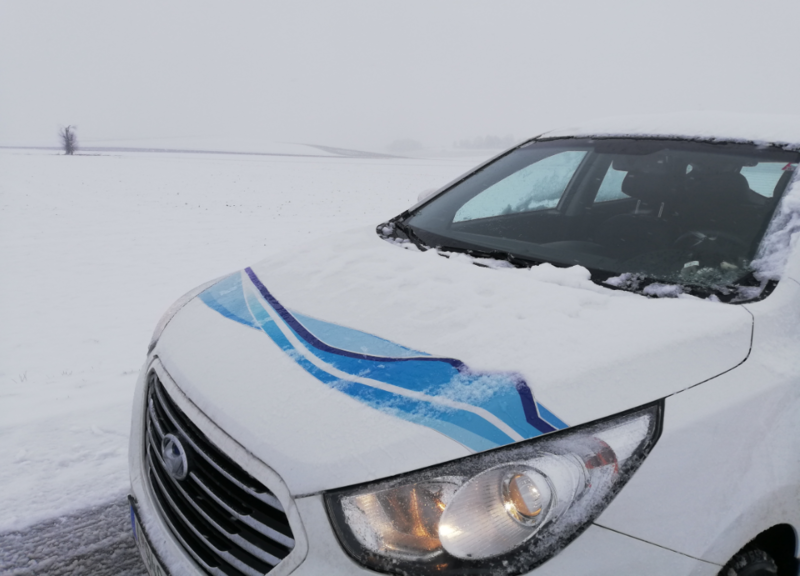 Just a quick word to add on the SNOW: I like testing electric (hydrogen) cars in Winter time. I don’t know much about the technology. 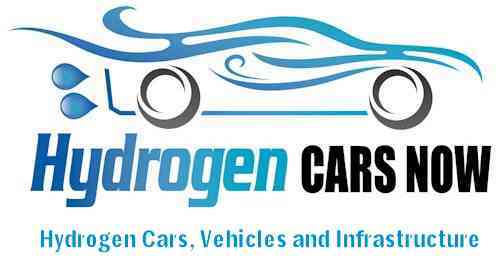 The electric hydrogen car has an electric engine as opposed to a combustion engine. 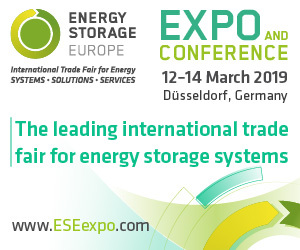 Instead of a large battery, as in pure chargeable battery-electric cars, there is a smaller battery in the electric hydrogen car, also referred to as the fuel cell-electric vehicle (FCEV). The fuel cell is there to produce the power for the electric engine while driving, and it is fed with the hydrogen. 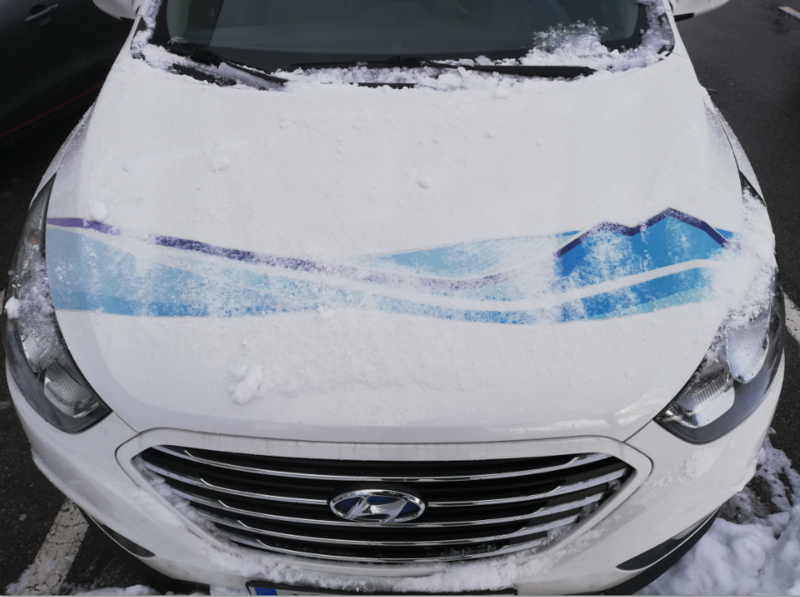 That is why these cars, such as the Hyundai which I drove (and which meanwhile feels like an oldtimer since the new Hyundai Nexo is already on the streets by the way) only need three to five minutes refuelling time, also comparable to compressed natural gas (CNG); say, very roughly 100 bar (gas pressure) per minute, though this I have already experienced can differ from pump-to-pump, of course. 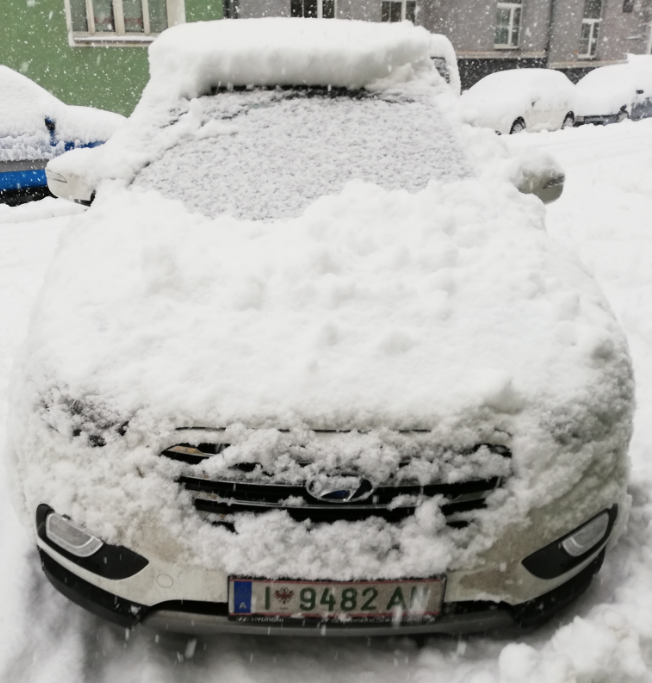 At 05.47 pm, I manage to return to Innsbruck amongst all the snow, and refuelled hydrogen again in Innsbruck on the next day (2.69 kg GH2), as seen below, before returning the car. The total mileage came to 297 km (185 mi). 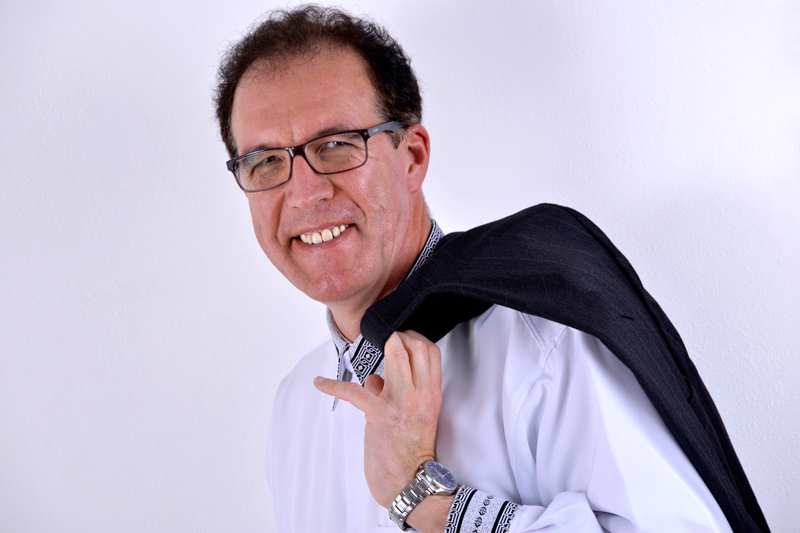 Already on the next day, Saturday, January 5, 2019, the article of our meeting together appeared in the “Dachauer Nachrichten des Münchner Merkur”; please see below. As it is in German language, and if anyone requires a translation, please drop me a line, anytime. Thank you to Mr. Nefzger, and to Armin Schöntag AGD, as well. In front of the hydrogen-Hyundai, one of Armin’s Renaults was parked (not in the picture). I test-drove a Renault ZOE once. See the Renault ZOE-blog from 2017.